Thailand is one of the most colourful and vibrant countries in the world. In Bangkok, it has a capital that’s all that and much more. A city that has been exposed to a variety of western influences, Bangkok has maintained its identity while ensuring that tourists and residents also get a taste of the world with a Thai twist. Taking you away from the night-life, street food and red-light districts of Bangkok, we take a look at some of the lesser known things that makes Bangkok a pleasure to be in. There are about a hundred or more large phalluses that form the shrine at Goddess Tubtim. 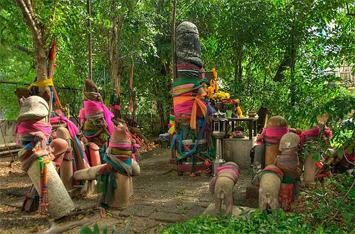 They come in all shapes and sizes and are a link to the spirit world for the people of Thailand. From blessings to fertility, the shrine has been known to bestow many boons onto visitors, right in the heart of the Swissotel Nai Lert Park Hotel grounds. 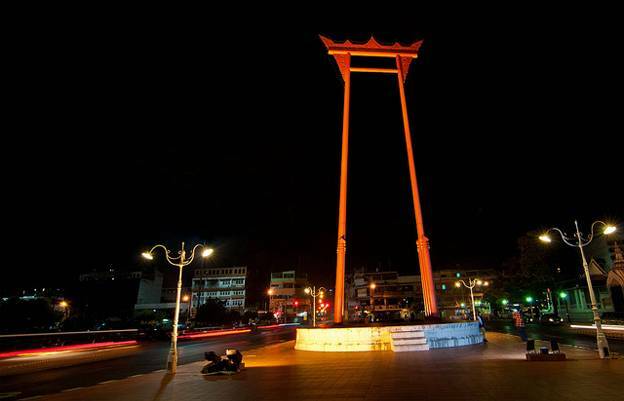 A massive pedestal, at Samut Prakan, has the statue of the three-headed elephant standing tall. This massive structure reaches a height of around 29 metres or about 870 feet and is around 39 metres, or 1160 feet, long. Cast in pure copper, this magnificent statue weighs about 250 tonnes and is the main attraction in the Buddhist shrine that spreads around this statute. From the moment you de-board from one of the many flights to Thailand, this is something that you can find all over its biggest city – gleaming houses that spread out all across the city, creating a little home for spirits to find a place to stay. These colourful structures are found near buildings, schools, homes and almost every single imaginable place. They are extremely beautiful and are a distinct and unique symbol of the way Thailand’s people look at life and its connection to spirituality. Whenever Brahmins gather together to thank Lord Shiva for their rice harvest, the (aptly named) Giant Swing comes into play! In earlier times, these Brahmins would swing a massive 80 feet into the air, trying to grab bags of silver with their teeth. This practice may have been banned thanks to the casualty rates but the structure still stands as majestically as ever, ensuring that you can visualise those moments in your mind. You rarely hear about people going all the way to a party-hub like Bangkok and ending up in a museum. 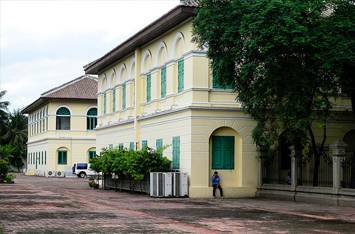 The Forensic Museum is one such place that tells you a lot about what Bangkok is to its residents. The museum is filled with exhibits that include some glass jars with deformed babies or disturbing photographs from autopsies. The entire place is like the city’s “hall of horrors” and if you are easily bothered by such things, a visit to this museum is highly discouraged. While we are running with the museum theme, you might as well take a look into the Corrections Museum, an institution that gives you a view into the lives of prisons and prisoners throughout the history of this brilliant country. There are plenty of shocking instruments of torture, from head-squeezing instruments to notorious confession-extracting devices that look completely devious. Making Guantanamo Bay look like the Hilton, this museum is definitely something that you should chalk into your itinerary. When you plan a trip to a city like Bangkok, its easy to get carried away by what the world sees and what you want to see. However, if you look into the deeper parts of this city, you will find an image that you just couldn’t imagine, existed. So forget the beaches, the women and the food & wine because there’s a lot more to Bangkok than what meets the eye. When Robert the author of “The alternative culture of Bangkok” went to Bangkok for the first time, he fell deeply in love with the place. Something really made a mark on him and for a long time, he kept returning to the city, looking for a way to settle down. After several such flights, Thailand presented Robert with the opportunity to start his own business and give himself the opportunity to find a place to live in the city that enthralled him. Robert spends his free time walking through the city, exploring it and after 15 years, still finds something new all the time.